Good News to all member-consumers! There will be no brownouts in the province of South Cotabato in the early months of 2011. “We have enough supply for South Cotabato,” South Cotabato Electric Cooperative (Socoteco) I General Manager Santiago Tudio said. Tudio added that the power barges are augmenting and Mindanao has been experiencing continous rainfall the past days making the hydro power plants in Lanao fully operational, giving ample supply of electricity for the province of South Cotabato. Meanwhile, rotational brownouts would likely to be experience in the months of March to May, when power supply declines because of limited water supply to run the hydropower plants in Lake Lanao. 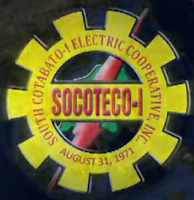 Socoteco-I serves the municipalities of Tampakan, Tantangan, Surallah, Banga, Norala, Sto. Nino, T’boli Lake Sebu and the city of Koronadal in South Cotabato as well as the municipality of Lutayan in Sultan Kudarat.